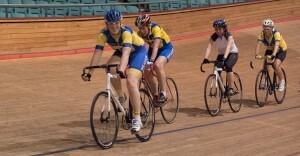 Track cycling. The perfect opportunity to get some excellent training and experience with the club. We have a British Cycling coach that will train you and give you probably the best 2 hour workout you’ve ever had, for far less money than you would spend on a personal individual session not run through the club. You’ll need to arrive for 7:30 to give you chance to pay, get your bike (unless you have your own), and your shoes (again, unless you have your own shoes with Look Keo cleats fitted). Adults: £10 for club members, £12 for non-club members – paid to Nick in track centre on the day. Bike hire (you’ll need one! ): £12.40 – paid at reception on the day. Shoe hire (if you haven’t got a pair of Look Keo cleats – others do not fit the track bikes): £5.20 – also paid at reception on the day.